2 flygirls: I'm Outta Here! We are 2 girls in New York with a passion for fly fishing and the beautiful places it takes us! Follow our journey as we attempt to master the art of fly fishing, have fun, and make new friends along the way. H: November 8, 2012: Woke up to 7 inches of blinding white snow blanketing the ground and draped heavily over trees and bushes outside my window, compliments of nor'easter Athena. Talk about adding beautiful insult to injury! At least I still had power. I was exhausted from a hellish wintry commute the night before due to downed power lines on the LIRR. But train service had been restored, so I put on my snow boots, winter coat, gloves and hat (all of which I could have used last night walking home in a blizzard! ), and headed into work. I had several things to take care of before I left on my first fall steelhead trip on the Salmon river. 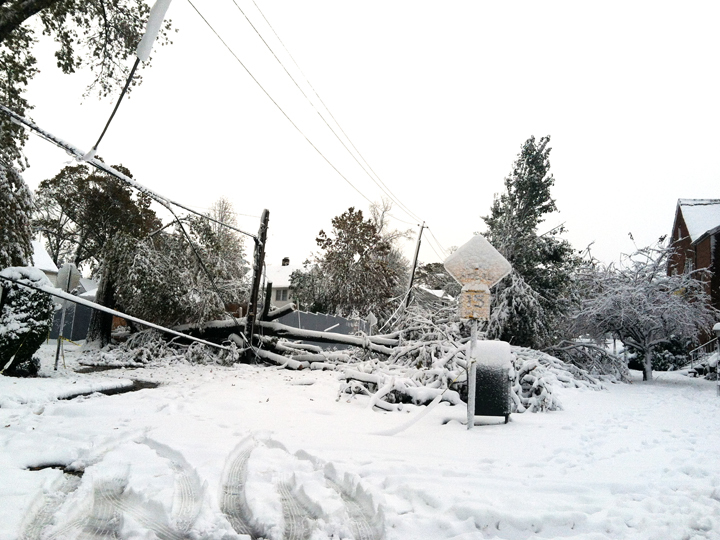 Snow covered, downed power lines and trees at my street corner. It's a trip organized by my women's fly fishing club, the Juliana's Anglers. After Hurricane Sandy, it was completely up in the air whether we'd continue with the trip. I've had mixed feelings about it. Some days, I craved to escape the disheartening reminders of Hurricane Sandy. But other days, the thought of fishing, even for steelhead, seemed frivolous and failed to arouse any excitement. Today, I can't wait to go! I've had just about enough that Mother Nature can dish out. Surely she will ease up now that Obama is in office. Tomorrow, it's off to Pulaski, NY and the Salmon river with fellow Julianas Shannon and KC. Wish us luck--a brief reprieve from any more natural disasters will do, forget about catching steel. I'm outta here! That's a lot of snow. After that storm you had think yourself lucky, hay? 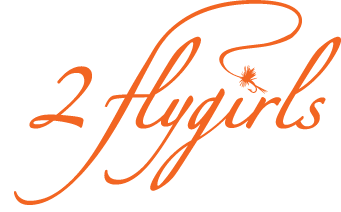 2 flygirls is copyright by Hyun Kounne and Josée. Logo design by Hyun Kounne. Simple theme. Theme images by TommyIX. Powered by Blogger.